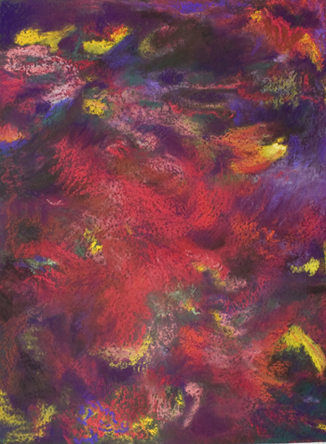 My recent series of pastel abstractions are based on the prophetic poem The Second Coming, W.B.Yeats, 1921. After the 2016 election, Yeats' lines “things fall apart, the center cannot hold” began to haunt me and I started this series. In the absence of direct observation, poetry inspires my art. Within the structure of a predetermined palette, I follow urgings of the unconscious. I create subtle transitions and shifting figure ground relationships that engage the imagination and unconscious. After decades of devotion to pastel, I am delighted to work with wet media on Yupo, a challenging, evocative,and slippery surface. References to the figure are emerging. I have painted en plein air for years, engaging in careful observation of nature all my life. Thus, much of my studio work evokes rhythms and light of nature. When I paint outdoors, my work is in response to energy and connections I experience in nature. I grew in Maryland and DC. Due to the impact of the McCarthy Era on my journalist father, we were a low-income, high-creativity family. My mother was a published short fiction writer at a time when women were only encouraged to be housewives. I moved from Brooklyn to New Mexico in 1987. I came because of the natural beauty and open space and have lived in Santa Fe, NM for nearly 30 years. I have a beautiful studio where I earn my living through my art, including teaching art and helping people through art therapy. I have lived longer in New Mexico than anywhere else. I do miss NYC and am pleased to be affiliated with the First Street Gallery in Chelsea, which gives me reason to visit. My work is also currently represented in Albuquerque at the Ralph Greene FreeStyle Gallery.